MagAO has been well represented here at the Spirit of Lyot conference, despite being a much smaller team than the other big AO planet finding instruments. Here are a few more pictures from our presentations over the past few days. Katie, in a convincing Laird Close disguise, presents her work on characterization of the Beta Pic exoplanet. Kim, impressing the crowd at her poster. TJ talking about his MagAO debris disk results. As a number of MagAO team members are currently at the “In the Spirit of Bernard Lyot 2015” Conference in Montréal, Québec, we’ll have a couple blog posts this week discussing this exciting direct imaging-focused conference. Spirit of Lyot is a large meeting held every 3-5 years focused on the imaging of extrasolar planets and circumstellar disks. Along with all of the hot-off-the-press science results in the field, the meeting is particularly focused on the innovative new instrumentation, and technologies in development or currently on-sky to pave the way to new discoveries. Laird highlighted the many unique capabilities of MagAO and the strengths of going to visible wavelengths. As VisAO has demonstrated soundly, visible light observations offer many scientific advantages: you can detect strong emission lines like H-alpha, you have a better chance of distinguishing object characteristics with wider color-magnitude diagrams, can obtain a nice estimate of the extinction due to dust, and of course achieve much improved spatial resolution! With the adaptive secondary, which is more robust to lost actuators, MagAO’s performance on-sky in terms of RMS wavefront error is ~135 nm and right at the error budget from the lab estimates, providing ideal resolution to do this science with exceptional sensitivity. Laird also made sure to talk about the many exciting recent results and ones coming soon, both disks and planet detection/characterization, with a run down of projects by Ya-Lin (new paper just hit arXiv! on the low-mass companion 1RXS J1609B), Jared, Katie, and Kate — more coming soon on these last two projects as the talks are being given later today! And the performance on-sky was very close to the predicted performance! You can also follow along with all of the updates using the hashtag #LYOT2015 on Twitter and Facebook! Click here to see the real-time Twitter results. During our recent observing run we tested a new set of coronagraphs (devices for blocking star light so we can see planets! ), which were developed by our friends Gilles Otten, Frans Snik, and Matt Kenworthy at Leiden University, in the Netherlands. Today Gilles gave a talk at the Spirit of Lyot Conference in Montreal, Canada. The new coronagraphs work spectacularly well! You can read about these results in Dutch, French, and in English. Astronomers from Leiden University (the Netherlands) and the University of Arizona (USA) have successfully commissioned a new type of optic that can reveal the image of an exoplanet next to its parent star. The ‘vector Apodizing Phase Plate’ (vector-APP) coronagraph was installed at the 6.5-m Magellan Clay telescope in Chile in May 2015, and the first observations demonstrated an unprecedented contrast performance very close to the star, where planets are more likely to reside. These results will be presented by PhD student Gilles Otten (Leiden) this Monday to the scientific community at the “Spirit of Lyot” conference in Montreal. Almost 2000 exoplanets have been detected to date, but only a handful of those have been imaged directly. Exoplanets are typically more than a million times fainter than and are lost in the glare of their parent star as seen from Earth. To directly image exoplanets and to characterize their atmospheres, astronomical instruments at the world’s largest telescopes use coronagraphs to suppress the overwhelming halo of light from the star. The vector-APP coronagraph uses the wavelike nature of light to cancel out the starlight whilst allowing the planet’s light to shine through. This manipulation is implemented through a complex phase pattern that can only be manufactured using advanced liquid crystal 3D patterning techniques . This technique creates two images of the star, for which dark D-shaped regions are located on opposite sides of each star image (see Figure 1). In this way, the whole region around the star can be scrutinized for planets. By combining several layers of liquid crystals, the device can be used over a wide range of wavelengths, including the infrared where the contrast between planet and star is more favorable. On May 6, 2015 a vector-APP coronagraphic device saw first light (at 3.9 um wavelength, in the infrared range of the spectrum) at the MagAO instrument, attached to the 6.5-m diameter Magellan Clay telescope in Chile. The telescope’s integrated adaptive optics system provided the instrument with sharp images of stars, which were consequently split up and modified by the coronagraph to exhibit dark holes in which much fainter planets could be imaged than without the vector-APP coronagraph. Figure 2: Double image of the star beta Centauri taken through an experimental version of the vector-APP coronagraph installed at MagAO. Both images of the star contain a dark region that covers the complete 360 degrees around the central star. In both cases, the binary companion to beta Centauri is easily detected. Coronagraphic phase pattern designed by Christoph Keller (Leiden). Credit Leiden University, University of Arizona. 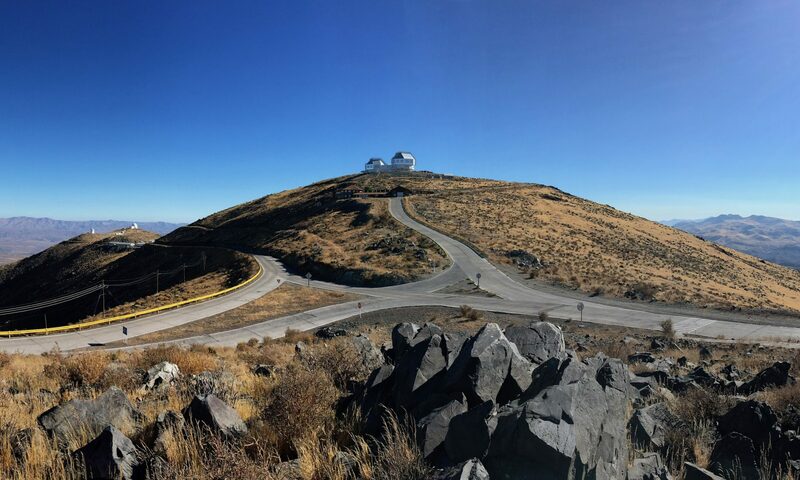 Support from the William F. and Elizabeth Lucas Junior Faculty Astronomy Award and the NASA Origins of Solar Systems program made this exciting commissioning possible at the MagAO instrument in Chile. This work was performed in part under contract with the California Institute of Technology (Caltech) funded by NASA through the Sagan Fellowship Program executed by the NASA Exoplanet Science Institute. For an introduction to the principles behind the vector-APP coronagraph, see Snik et al. (2012) and Otten el al. (2014). The name “vector-APP” stems from “Apodizing Phase Plate” based on polarization (vector) techniques. The original optical theory was developed by Johanan Codona at the University of Arizona. The vector-APP coronagraph devices for MagAO were developed in collaboration with the group of Dr. Michael Escuti at North Carolina State University, and were produced by ImagineOptix.